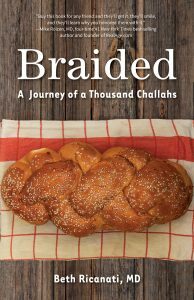 Below is my Q&A with Beth Ricanati, MD, author of Braided: A Journey of a Thousand Challahs. 1. What is your book about and why did you write it? Braided chronicles my journey of learning to make challah, and in the process learning how to slow down and be present. 2. So you’ve made challah from scratch every Friday (give or take a few) for the past ten years. What inspired this tradition? A friend suggested ten years ago that I make challah for the Jewish New Year (this coming week!). I had never done anything like this, and quickly got hooked. 3. How has this meaningful ritual helped you cultivate new and strengthen old relationships? Making bread together is a wonderful way to both create and sustain community. I often make challah with other women, most of whom I know but some that I don’t. Standing at a kitchen counter with a group of women, all of our hands in bowls of dough, sharing stories, is a very moving, powerful experience. What was your family’s reaction over the years? They love the challah! Our children’s friends love the challah. It’s a great way to bring everyone home for dinner on a Friday night! 4. You spend a chapter of your book taking a deep dive into the six ingredients that make up challah. As a physician, what is your argument for baking this white loaf on a weekly basis? I believe in food as medicine ~ what foods we eat matter, the quality of those foods matter. Whenever possible, I favor organic foods, lots of fruits and vegetables and protein; low sugar and even lesser amounts of processed foods. And with all that said, I also believe in moderation. I don’t each much white anymore – white flour, white bread, white pasta – but a piece (or two or three!) of challah once a week is more than ok. Challah is special; it nourishes us both physically and spiritually, so for me to have a little white flour once a week in this setting is more than ok.
5. Over the past ten years you’ve experimented with these ingredients – what type of sugar, what type of eggs, what type of flour, etc. What did you discover? (See answer 4!) If possible, I want the healthiest option available ~ I’ve learned about organic, free range eggs, organic sugar and flour, organic non-gmo canola oil! And with all that said, this is a loaf of bread shared by many and we do the best that we can do, so if organic is not your thing or you can’t get a certain kind of egg, so be it. 6. There’s often a fear by amateur bakers around recipes that call for yeast – did you find working with yeast challenging at the beginning, and how do you feel about it now, ten years into the baking tradition? I had no idea how to work with yeast! Fortunately, my friend answered many questions that first day ~ I didn’t know what it meant to proof the yeast, what the bubbles would look like, etc. Since then, I’ve experimented and come to realize that it always works out as long as I make sure the water is warm enough. I realize now that some weeks the bowl with the water and yeast and sugar will look different, and that’s ok! 7. Your book is about your journey baking challah specifically as your personal weekly habit – but can the benefits and lessons learned from this meditative behavior transfer to other habits or hobbies if, say, I don’t want to bake bread every week? Absolutely! I believe that we all need meaningful rituals in our lives; I think they are a great prescription for stress, for example. While I love that making challah is my meaningful ritual, I think that these behaviors are applicable across the board. Maybe you like to garden, or take photographs, for example. 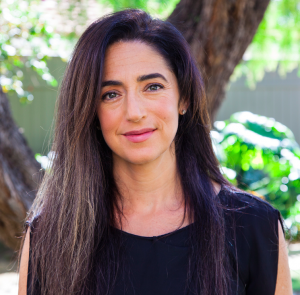 BETH RICANATI, MD has built her career around bringing wellness into women’s everyday lives,especially busy moms juggling life and children. She received her undergraduate degree from the University of Pennsylvania and her MD from Case Western Reserve University; she completed her internal medicine residency at Columbia Presbyterian in NYC. She spent ten years in practice at the Columbia Presbyterian’s Women’s Health Center, the Cleveland Clinic’s Center for Women’s Health, and the Cleveland Clinic’s Wellness Institute.